Pioneer Day is an official Utah state holiday celebrated on July 24th. It commemorates the entry of Brigham Young and the first group of Pioneers into the Salt Lake Valley on July 24, 1847, where the Latter-Day Saints settled after being forced from Nauvoo, Illinois. Every year our stake, along with most in the country, celebrates pioneer day on or near this date. Today the Cedar Rapids stake had their annual picnic at Thomas Park. It was another cool day in the low 60s and breezy. I knew I should have brought a jacket half way there. I stayed two hours all the while enduring goosebumps and when I couldn't feel 3 of my fingers I decided to it was time to leave, but Little Man went missing. I frantically called Haldan who suggested he might be by the creek. After searching for some time I located him down by the creek, just as Haldan had predicted. 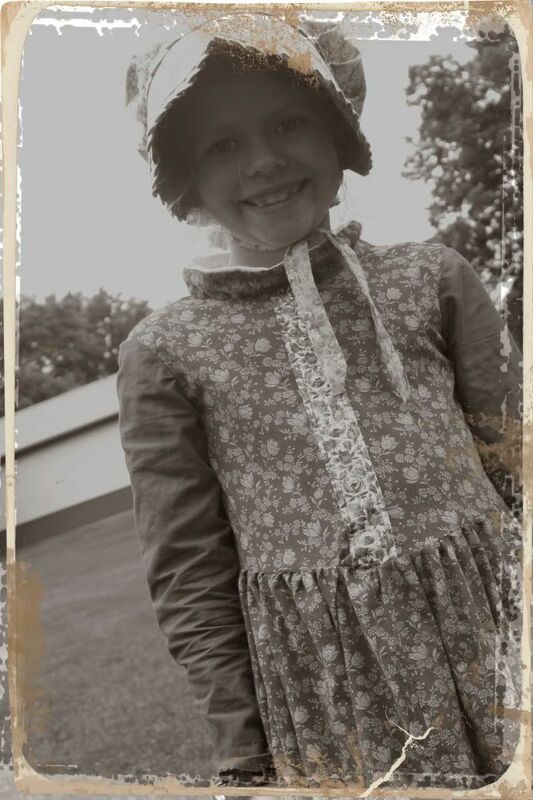 One of my friends forgot her camera and asked if I could photograph her daughter in her pioneer clothes. I didn't ask, but assumed that she had sewn it herself. That's one of her gifts. I thought it would be a neat effect to age the photo, but I learned that it's pretty tricky business. I've been working for years to master perfecting photos and fixing aged ones and now I'm trying to age them myself. Seems ironic, but I like the result. In other news, Haldan participated in his 2nd bass fishing tournament today. He caught a 2 lb, 16 in small mouth bass. He got home in time for Pokey's meltdown at dinner. She was late, complained about what we were eating, and then whined. The short version- "love and logic" has failed us with this one. She cried for several hours before finally crying herself to sleep. Alicia... I can't thank you enough for the photo CD with my daughter's pictures. That was way more than I expected. I'm touched. Yes, I did make the dress but it's a 'funny' story. I had actually made the dress for myself and didn't like it two years after I made it. I said one day that would I do something with the material and this year I finally did. I thought it would make a cute pioneer dress so I cut it up and altered it to my daughter's size. She picked out the ribbon and buttons. Thankfully my mother-in-law bought the pioneer hat in Nauvoo last year. So.. that's the story of my recycled pioneer outfit.